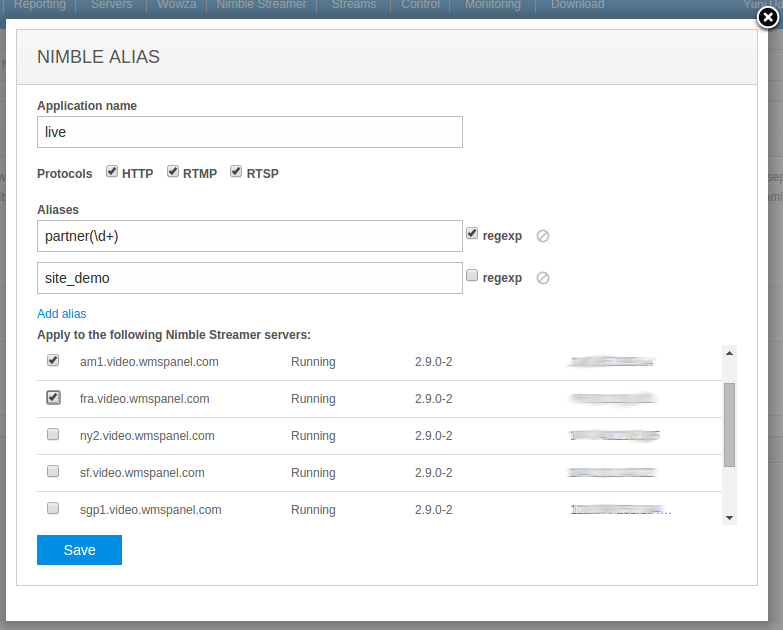 Log into WMSPanel and go to Nimble Streamer -> Aliases top menu. You will see an empty list of aliases. Click on Add alias to see a dialog as shown below. Choose sets of protocols to be applied these aliases to - HTTP-based (HLS, DASH, Icecast), RTMP and RTSP. Nimble Streamer instances where you'd like to apply these settings. Having this being set up, you will see new aliases in the list. You may move aliases within the list in order to set their priorities. The topmost alias has top priority. You may specify some general alias via regular expression, and then override it with specific alias for some specific stream. Aliases can also be managed via API, check WMSPanel API reference for details. Having this feature set you can set any variation of aliases settings which will help your scenarios and use cases. Contact us if you need any improvements for this feature set.